A bright and lovely jewelry display, this item is perfect for showing off your dainty little items of jewelry! If you’re looking for different and efficient ways of storing your lovely jewelry, this display should be perfect for you! It is manufactured out of a premium and sturdy crystal-clear plastic material that is durable and resistant. The bottom and top lid are a beautiful dark navy blue with reflective qualities and the body of the display is a shiny and glimmering light silver. The display is quite high and will be able to store up to no less than 96 pairs of earrings, regardless of their size. 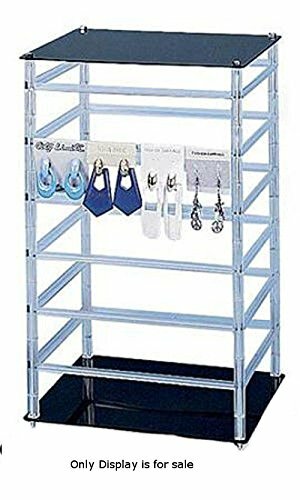 Therefore, this product is more than ideal for the depositing and displaying all of your pairs of earrings! In addition to all that, this product can rotate as well, thus providing even a better view and show of your jewelry. Obviously, it is perfect for the display of items of jewelry in specialized accessory department stores. You can choose to purchase this or offer it to anyone who’s a great lover of earrings. You will be able to show off your belongings to everyone much easier from now on! You can place the display pretty much anywhere, given its neutral style, and it won’t clash with the decoration of your environment. Purchase this efficient item and you will see how much it benefits you with the safe-keeping of your jewelry! The overall dimensions of this product are the following: 10″ W x 10″ L x 17″ H.